9.0" x 12.0" stitched on 14 count. 7.0" x 9.3" stitched on 18 count. 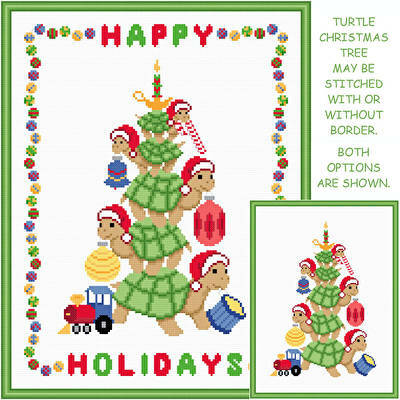 Turtle Christmas Tree cross stitch pattern... The turtle family is creating their own Christmas tree. Each turtle is wearing a Santa hat. May be with or without the border and wishes. Colors may be changed. Whole/back stitches are used.